In 2012, a preteen entered the emergency department at Children's National Medical Center in Washington, D.C., with a high fever, weight loss and diarrhea. The attending pediatrician suspected a rare, travel-related infectious disease, as the child had just been in Southeast Asia. Specialists combed through the Centers for Disease Control and Prevention website for health alerts from the region. They ran tests. All came back negative. Only after two days did the hospital turn to a diagnostic decision-support software program called Isabel. Once a clinician typed in the child's symptoms, a list of potential conditions popped up within seconds. The specialists quickly realized their initial mistake. “Biased by the patient's travel history, we didn't consider a pretty straightforward diagnosis,” recalled Dr. Paul Manicone, associate chief of the hospitalists division for Children's National Health System. Isabel directed the team's attention to hyperthyroidism, a condition they had overlooked. In September, the committee called diagnostic mistakes a persistent blind spot amid efforts to improve quality and safety in healthcare settings. The report recommended research into computer-assisted diagnosis technology. Diagnosis-assist programs are particularly helpful in difficult or rare cases. Users enter symptoms, such as fever, abdominal pain and skin rash, and patient characteristics, such as medical history and gender. 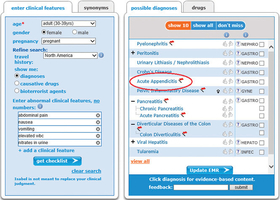 The software generates a list of diagnoses and ranks them in order of likelihood. Focus initial efforts on clinical areas at highest risk of diagnostic error, especially the ICU and ED. Start at top of the hierarchy: Residents often feel uncomfortable challenging senior staff. Make software readily available through electronic health records, on tablets and on desktops. Studies suggest the programs have been successful in boosting physicians' diagnostic confidence, reducing costs and improving patient outcomes. At Children's National, checklists generated by Isabel pointed to the correct diagnosis in 43% of pediatric ailments, according to preliminary findings shared with Modern Healthcare. In 2000, DXplain, a similar tool, was offered to general medicine residents at the Mayo Clinic's St. Marys Hospital in Rochester, Minn. Clinicians were encouraged to use it for “diagnostically challenging” cases. A subsequent analysis found DXplain helped reduce costs for Medicare Part A patients by an average of $900. If used nationwide, the savings for Medicare patients alone could approach $100 million annually, according to a 2010 study in the International Journal of Medical Informatics. Physician overconfidence is a major stumbling block to wider use. A 2013 study in JAMA Internal Medicine found overconfidence may prevent physicians from re-examining difficult cases in which their diagnosis is more likely to be incorrect. Unwarranted certitude “is the big challenge we face,” Hoffer said. Even the Mayo hospital that had success with DXplain no longer uses it. But Hoffer said about 30 U.S. medical schools as well as 15 hospitals, clinics and healthcare systems license the product, which ranges in cost from about $500 a year for a small practice to $12,000 for a large system. Diagnosis-assist programs are helpful in managing difficult or rare cases. Donald Bauman, CEO of Isabel Healthcare, which launched the tool in 2004, says it is used by about 130 U.S. organizations, including physician practices, medical schools, hospitals and health systems. A subscription for Isabel can range from $299 a year for an individual to as much as $15,000 for a large practice of 75 providers or more.